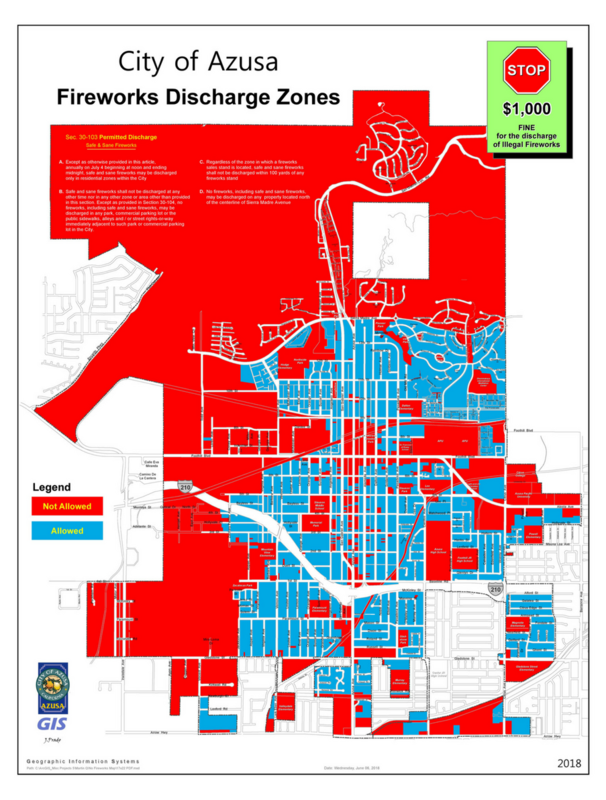 The City Of Azusa has a long-standing tradition of allowing the lighting of "Safe And Sane" fireworks at certain locations, within the city limits. "Safe And Sane" fireworks are those which you can purchase at various fireworks stands within Azusa, and have a label similar to the one shown on this page, affixed on its packaging. To ensure the safety of all residents, business owners and visitors to the City of Azusa, the Azusa Police Department will be deploying additional personnel during the days and nights immediately preceding and on the 4th of July. When Can I Light Fireworks? You can enjoy your fireworks on July 4th, between noon and midnight. Can I Light Bottle Rockets, Fire Crackers Or Mortars? No! All of these types of fireworks are illegal. With the popularity of our social media program, we have more witnesses and people willing to report locations and violators to us. This means more people will be watching and reporting this year! Our officers may be in patrol cars, regular cars, uniform or plain clothes. You're taking a risk!